yoshimi the flying squirrel: How do I? How do I start a blog post after this long silence? Basically I haven't sewn much these days. Instead, I've been either busy or tired with all things that happened to our little family and to myself for the last several months. In short, we decided that I could lessen my scientific work drastically to the level of almost zero, that we could move in some other cozier house in the same area, and that the daughter could stay with us again and go to College from home. It took some time but we managed to make all things happen nicely and now everything around us seems better and settled. Now, all of us are happier than ever. That said, I have to confess that I unnecessarily made the fuss even bigger during the transitional period, by getting sick or injured from time to time. I courageously joined in this year's Pattern Review Sewing Bee contest this fall and it helped me a lot (to have a thermal runaway in my brain) too. Well, life is so eventful. 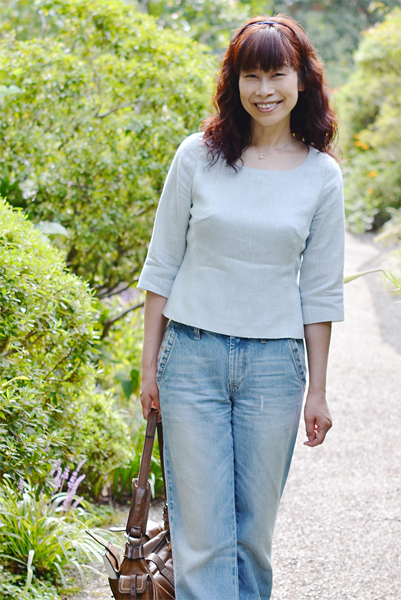 In fewer words, this post is a report of the projects which I sewed for the sewing bee contest. If you are interested in detail of the projects, please visit my reviews in PR site from the links. Lastly, I put a picture of my room below. This is the current status of my new sewing space. It is a very small corner of a room, and I started liking it very much. By the way, I knitted the pink hat on the dress form yesterday. I have just started expanding my creativity at my new space, so I will see what kind of sewing happens here in the very near future. I hope you are having a great time, I will try to have a good one too! Keep you safe and warm. Love each other. Hello! (waves) so nice to see you again! I've been thinking of you so I'm so glad you are well and happily settled in your new place. I've seen your posts on IG, so I have seen that you were busy moving along with everything else. Life gets busy and IG is quicker. May you be inspired as you discover your new sewing space. I missed reading your blog and I'm sew glad you have returned! enjoy your new time away from work, I know from experience that you will find a lot of joy in sewing and creating. also I somehow missed seeing your #4 entry in the contest - great look. Thanks for the update! You have been a very busy bee, haven't you? Your work is beautiful Yoshimi. It's good to read your posts whenever you blog and I'm glad your family is happily settled in the new place. Yoshimi, "HI", nice to hear from you again. I like your Sewing Bee entries. Moving is quite an enterprise, isn't it? I do not like the process at all, even though things are better once the dust settles. Nice to see you blogging again. You did a great job with your sewing bee entries. Yay! You're back! I'm happy to hear that life has settled down for you. 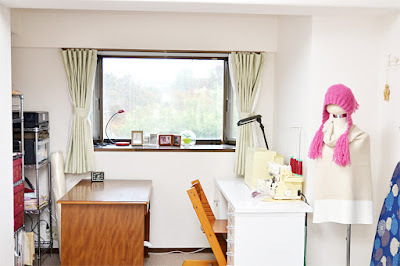 Your new sewing space looks lovely and I loved following you on PR. I thought your contest entries were amazing! Hurray, you're back! I'm so glad to see you looking well, and I have been following your posts on IG in the meantime. I love that fitted blouse so much - I think it's my favorite of the three, though they are all so lovely! Congratulations on getting through to Round 4 of the Sewing Bee, all your entries are lovely. Enjoy making your new sewing space your own haven for creativity - setting up a new space can be so much fun! I especially like your Olympics outfit! wow I am so impressed that you made these lovely garments and managed all the other Life stuff. You are so creative Yoshimi . I would l would love to learn how to do felting . I must look up some classes . Thankyou for your inspiration . http://sewing.patternreview.com/review/pattern/116266 I should make this blouse!! Just read about the quake in Japan. Are you and yours okay? from Creative Hormone Rush: Oh it's so nice to see you back! I've missed all your beautifully made garments, lovely photography, and thoughtful descriptions. Your new creative corner is lovely, and looks like a peaceful resting place where you can recuperate from life's challenges.